Charlene Reano of San Felipe is married into the Reano family. Jewelers from Santo Domingo are well-known for their inlay work. 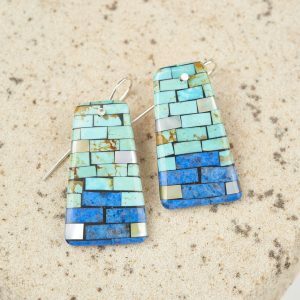 Charlene’s inlaid earrings, pendants and bracelets have the appearance of intricate, colorful tiles — a mosaic of rich color and pattern. 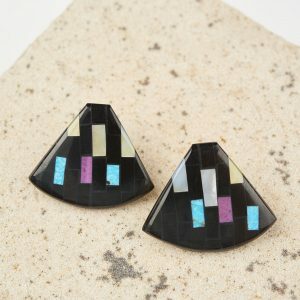 She and her husband Frank collaborate on most of their jewelry. 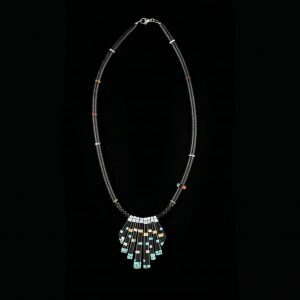 Charlene studied at Highlands University in Las Vegas, New Mexico and later cut and set stones for gold and silver inlay at a jewelry manufacturing company in Albuquerque. 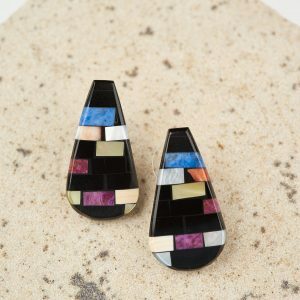 She learned jewelry-making from her sister-in-law Angie Reano, who is credited with reviving mosaic inlay among Santo Domingo jewelers. 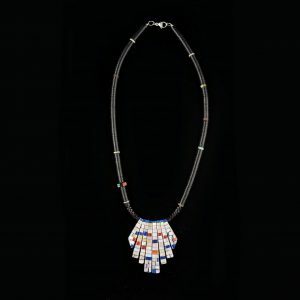 The type of inlay work created by Charlene and her in-laws has a revered history dating back to their Anasazi ancestors. Stunning earrings and pendants have been unearthed from ancient dwellings — extraordinary pieces made by patient hands one thousand years ago.